We don't always blacklist problematic tags or terms, but when we do it's because they've become such a nuisance on a site that we can't control them any other way. 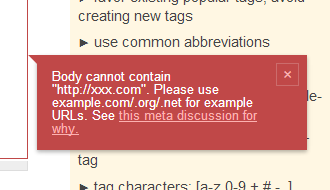 Vague / meta tags that keep coming back, domains or urls that we really don't want links to, etc. Just because a change allows the post to avoid the blacklist doesn't mean it's the sort of change we were hoping to inspire. Using URL shorteners to get around URL blacklists is a prime example, but there are even worse unintended consequences. Asking about it on meta is good, but time-consuming and... The meta discussion that prompted the blacklist almost certainly already exists! This would also enable something else we normally try to avoid: blacklisting unwanted tags before we've finished cleaning them up. By providing specific alternatives in the error itself, it would be much less painful for editors unaware of the cleanup effort while preventing its use on new posts while the cleanup effort was ongoing. That's the first blacklist entry to have custom guidance added. We'll add more as needed. Not the answer you're looking for? Browse other questions tagged feature-request status-completed blacklist . Warning when using a blacklisted tag - is it customizable? Deliberate misspellings in titles to get around 'probelms' with banned words?